ZSA is ready for the Zombie Apocalypse! 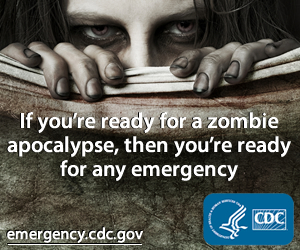 CDC, we appreciate your wisdom and good sense of humor. Started at ground Zero – Eagle 1 Supply Raleigh NC! This entry was posted in Info and tagged CDC, Zombie Apocalypse, Zombie Shooters Association, ZSA. Bookmark the permalink.